I had a birthday recently, and my friend Heather was visiting. 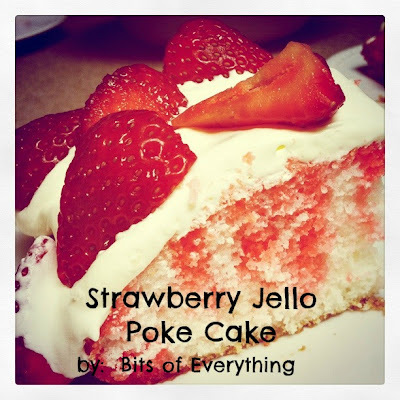 Of course I remembered… and for reminiscent sake, Heather made me a jello poke cake for my birthday. For this cake, we got the recipe from the Betty Crocker Website. Heat oven to 325°F. Place rose shape bottom in Betty Crocker® Bake Art springform pan. Spray bottom and side of pan with baking spray with flour. Make cake mix as directed on box using water, oil and egg whites. Pour batter into pan. Bake 45 to 55 minutes or until toothpick inserted in center comes out clean. Cool completely, about 1 hour. Poke cake all over with fork. In small bowl, stir gelatin and boiling water until dissolved; stir in cold water. Pour over cake. Refrigerate 2 hours. Run knife around side of pan to loosen cake. Invert cake onto serving plate; carefully remove pan bottom. Garnish cake with berries. Store covered in refrigerator. Kinda funny…but I made this yesterday. 🙂 Only I used a white cake mix with the addition of lime zest, lime jello, and a vanilla frosting with lime juice and zest. Yum! YUM! Thanks for the post. I absolutely love the lime version of this cake! It would be fun with lemon, orange and any flavor!! If you don’t use cool whip icing does the cake have to be refrigerated? ?